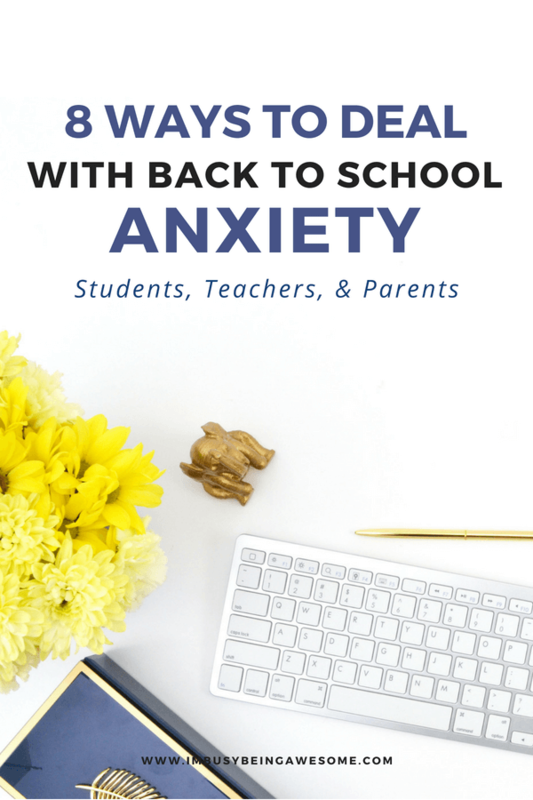 Whether you’re a parent, a student, or a teacher, chances are you’re familiar with back to school anxiety. You may not call it by that name, but you’ve probably experienced it at one time or another. In fact, I experience these very emotions almost every year before school starts. So if you or someone you love experiences back to school anxiety, then you’ve come to the right place. Because today I’m here to share with you 8 ways to quiet those nerves and start the year off strong. One of my biggest causes of back to school anxiety is worrying I’ll forget something. I’m convinced that I’ll overlook some major detail, and I’ll end up starting the year off behind schedule. In order to silence that worrying mind, I make a to-do list of everything I need to accomplish. By writing things down, I reassure myself that I won’t forget the tasks, and my chatty mind takes a break. I don’t know about you, but when I stare down anxiety, a feeling of overwhelm often takes over. I start imagining the worst possible scenario, and soon enough, I’m convinced it will happen. If you can relate, then do yourself a favor and give this strategy a try. Because if we don’t take steps to silence that racing mind, it can quickly take over our emotions. If you start feeling fear take over, spend some time telling a friend about it. Share that “worst case scenario” that you’ve built up in your mind and don’t skimp on the details. By talking with your friend, and sharing your (often outrageous) story, you realize how unlikely it is that the situation will unfold. Speaking your fear aloud to someone else helps you take away fear’s power and start focusing on the good instead. Additionally, this gives you an opportunity to practice if-then statements. What are if-then statements, you ask? They are a great strategy for creating plans and silencing your worrying mind. Simply state the obstacle, and then offer a simple solution. By coming up with a plan, you kick fear to the curb, and you silence those worrying thoughts. If you or your child experiences back to school anxiety, sometimes distraction is the answer. Sitting in dread or anxiety for weeks leading up to the first day of school is fruitless. It not only brings you down, it also depletes your energy. If you can distract yourself with a new project, outings with friends, or a great book, however, you can mute that anxiety for a while. I’ve mentioned in previous posts that exercise plays a big role in my life. It’s part of my morning routine, and it brings a feeling of calm to my everyday life. When I’m experiencing anxiety, exercise becomes even more valuable. You see, both stress and anxiety release adrenaline in our bodies. When we take time to exercise, however, we release that hormone, which helps drop our anxiety levels and return to a state of calm. On the opposite side of the spectrum from exercise, you might also try meditation. Taking time to quiet your mind and tune out everything around you can leave you feeling relaxed and centered. If you can’t seem to silence your anxious mind, then focus carefully on your breath; try counting each inhale and exhale if you need something on which to focus. I’ll be the first to admit that I am an AWFUL meditator. I can’t seem to go 30 seconds without a random thought popping into my head, but that’s okay! If you find yourself struggling with that same chatty mind, simply acknowledge the thought and then clear your head once again. 6. Lighten up on the caffeine and alcohol. It goes without saying that this tip is intended for adults. Both caffeine and alcohol are stimulants, which often make anxiety worse. So try to focus on drinks like water, milk, or decaf tea and coffee. Additionally, foods like berries, yogurt, nuts, and legumes have proved to reduce anxiety as well. Think of a phrase that brings you feelings of peace. Then, simply repeat that phrase in your head. My favorite phrase at the moment is: “all is well.” It’s simple, but it also brings me incredible comfort. Rather than stressing about what you’re going to do in the next month, week, or day, try focusing on the minutes in which you’re living right now. Look at the things around you. Consider the temperature of the room. Think about the chair in which you’re sitting. Look at the clouds in the sky or the texture of the wood on your desk. I love using this strategy when my anxiety reaches 10 and I need to bring it down quickly. I take some deep breaths and I focus on what I’m doing at that EXACT moment. I don’t think about the past or the future. Only the now. There you have it, friends. 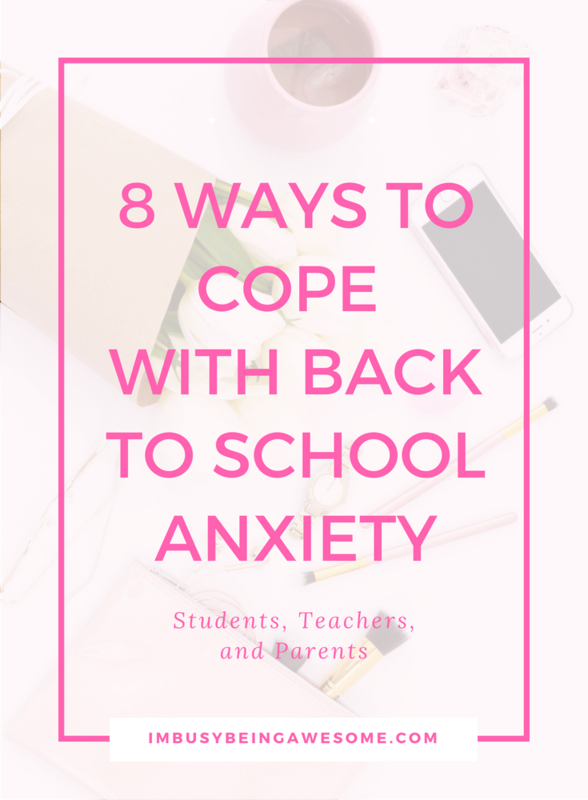 If you or anyone you know is experiencing back to school anxiety, then give these 8 strategies a try. You’ll be quieting your anxiety in no time. Want to keep these strategies on hand? Then download a free PDF version that you can print out and keep with you for whenever anxiety strikes. 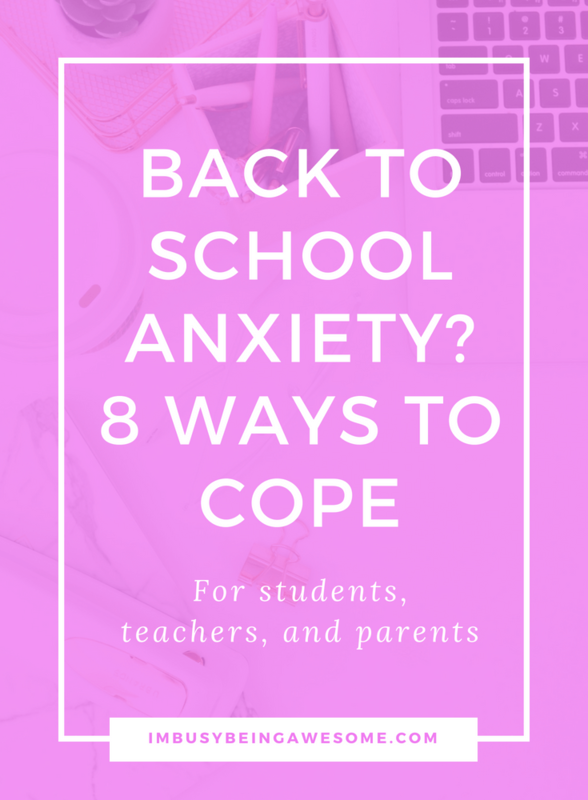 Do you know anyone who struggles with back to school anxiety? How do you handle anxiety? What strategies would you recommend? Let me know below! Very good tips! So important to be intentional about thinking in the now. My son suffers from anxiety and this was always a battle for him. Taking time to breathe, and realize that you won’t die from it always helped. Yes, absolutely! Just taking those few extra moments to take deep breaths and collect yourself is so important. My kids are excited to go back to school, but it’s still 3 weeks away. I’m sure there will be some jitters the day before. I am working on getting them to bed on time and slowly starting to wake them up earlier to help with the transition. That’s terrific! I love hearing when kids are excited to go back 🙂 And it’s great that you’re helping ease them back into the routine. I’m sure that will be incredible helpful ! Gosh I wish I read this when I was still i school. This could also work for going back to work. These are great tips for everyone! Cutting back on caffeine really does help. Thanks, Marissa! And I agree. It makes such a big difference. These are great tips for back to school, before a big job interview, first day at work or first date, you name it! Love how it can be applied to so much in life. I think these could all be applied to most anxiety-inducing situations. Meditation is something that I need to start doing again. Thanks, Jenni! Meditation is such a powerful practice, isn’t it? As a homeschool family we don’t really face this too badly, we do get butterflies in our stomach when attending new classes through co-op, though. 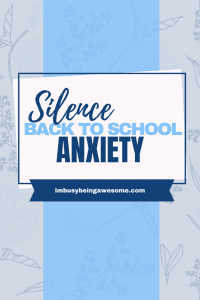 It’s great that you don’t battle with back-to-school anxiety too much! I agree – anything new and unfamiliar can add a bit of anxiety to the plate.